"All's fair in love and war” needs an update. John Lyly's proverb didn't account for chemical weapons. Today, international rules say these agents aren't fair, even in war. But people have been using chemical warfare agents against each other since we discovered poisons. The Organization for the Prohibition of Chemical Weapons monitors and controls the use of chemical weapons across the world. But how does this organization and other scientists know when chemical weapons are used? How we identify which weapons were used? Let's ask a chemist. 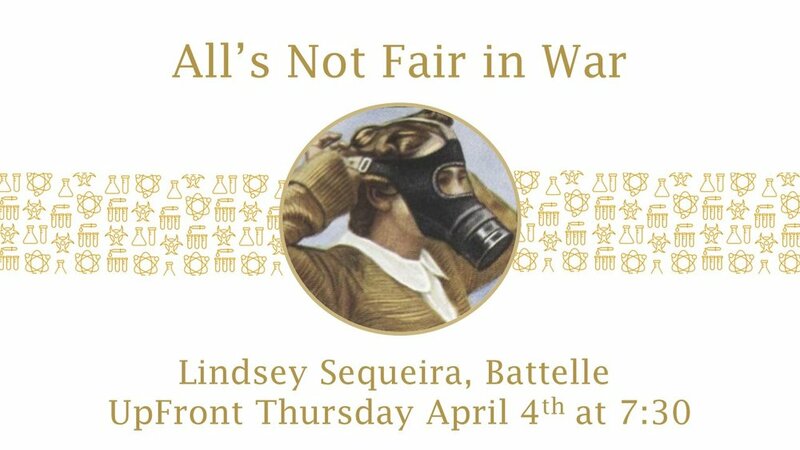 Lindsey Sequeira will guide us through the periodic table and beyond in April's Science Pub on chemical weapons. As a chemist at Battelle, Lindsey works on chemical analysis for government and commercial clients every day. She'll tell us how chemical weapons were developed and their first uses of chemical weapons. And she'll how us how chemistry how modern chemistry gives us the tools for detection and protection, not just harm. Lindsey has a Master's in Analytical Chemistry from Oregon State University and joined Battelle in 2015. She was also Student Affiliates President of the Georgia Southern chapter of the American Chemical Studies while pursuing her bachelors at Georgia Southern University.